I’ve been thinking about Smurf Village as a metaphor. A series of metaphors. First, capitalism. Or maybe feudalist proto-capitalism. Someone gives me free blueberry seeds. I have a few slaves. They’re slave-Smurfs. I provide them housing, but no pay. They have no control over their working conditions. They do not enjoy the products of their labors. I use those free seeds to build wealth, with which I gain more slaves by building more housing. Once I accumulate enough wealth, I can plant crops that yield more profit. I can work my Smurfs around the clock. And I do. I actually feel guilty, but I can’t let my fields set idle. Even when I have more gold than I can spend in the SmurfStore. I want more. So my little Smurfs barely sit down on the logs I’ve provided (because they earn points from Timber Smurf) and I’m calling them back to produce more wealth that I don’t really need. That’s the system. There’s no out. No Smurf Revolution. No LaborOrganizer Smurf. The gender implications aren’t much better. Smurfette is the only girl in the village (we’ve been down this road, I know), but she gives experience points every so many hours by blowing kisses. The more Smurfs that are around when she blows, the more experience points I receive. I benefit more the more Smurfs she blows. I used to call myself a feminist. Smurf Village might also be a metaphor for our culture. I get some modicum of satisfaction from harvesting my crops and watching my gold grow, from expanding my village and building more houses and fields. My input is even more minimal. Or is it? 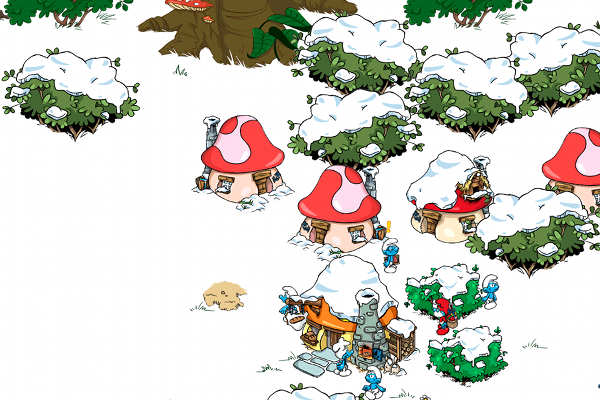 I watch my Smurf Village more closely than my retirement account (which refuses to grow). I now check Smurf Village more often than my email. I used to be addicted to email. Now it’s a distraction from my Village duties. Luckily, I just planted golden corn, which won’t mature for ten hours. At least I can sleep through the night. Until my scouting party returns from spying on Gargamel. I am a sad little person. Papa Smurf has a potion for that. A new phone. A four-year-old daughter looking to be entertained. At first she didn’t get it and I left her to her own devices. She figured it out. Digital native. I realized she needed coins and that we had a choice of crops. We started off with the gateway crop: the free blueberries that could be harvested in 30 seconds. Now we’re up to potatoes that take 24 hours to mature. Our son has organized the village into farming areas and residential zones. I check the Village when I come back from a meeting. When I wake up in the morning. The kids manage the Village in the car. How has this happened? I laugh at the Farmville notifications. But we’re in the middle of a mission from Papa Smurf to bring in 30 artichoke harvests. I think we need an intervention. I’m doing it for the kids.